* Kona premium toned artist journals are made from a unique blend of recycled coffee bean bag fibers and post consumer fibers. * These long strong jute fibers produce an ideal tooth and surface for toned artist paper. 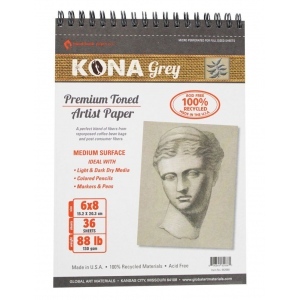 * Kona Grey toned paper is perfect for colored pencils charcoal as well as markers and pens. * Spiral bound at the top sheets are microperforated for effortless removal.